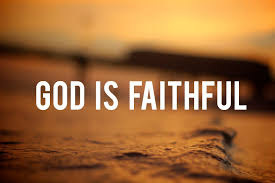 On Wings of Eagles: God Is Faithful. Having faith in God isn’t about how good and how well we can trust Him. Our faith in Him is powerful because of WHO God is. HE is trustworthy, faithful and never failing. We trust God because of who He is and what He has done in our lives. He loves you, has a plan for you and is faithful to you. He’s not going to leave at the first sign of trouble, He’s not going to give up when things seem to hard and He’s not going to forget about you. HE is faithful and we can have faith and trust in Him. The One who promised is faithful. Take a moment to think about who God is. Now think about some areas of your life that you can trust God to take care of. Pray about these, remembering the One who promised is faithful. Dear Lord, You are almighty, faithful, holy and loving. We give to You any worries we have, knowing that You are faithful to do what You’ve promised. In the Name of Jesus, Amen.